I’ve never considered a city hotel just a spot to sleep between sightseeing, but rather an extension of the city itself. The right home base achieves a perfect balance of creature comforts, urban polish and sense of place — it’s as much a destination as the streets that surround it. Belmond Charleston Place, tucked amid the bustle of historic downtown Charleston, rises admirably to the challenge. Built in the late 1980s and fresh from a comprehensive facelift, the hotel manages to evoke an aura of old-world splendor in a city where past and pedigree are everything. And while it may appear formal at first blush, its family-friendly heart quickly begins to shine through. There are cities where you could stay in any number of districts and be equally well positioned for exploring, but here, the historic core is the place to be. This is Charleston as you picture it: cobblestone streets, antebellum single houses with tiered porches, the sound of waves lapping the harbor and the twisting branches of live oak trees. Ready to book a stay at Belmond Charleston Place or plan a trip to South Carolina? Charleston Place sits at the juncture of Meeting Street, King Street and Market Street, the storied thoroughfares that have anchored the downtown neighborhoods since their earliest days. Venture a few blocks in any direction and you’ll pass luxury boutiques, 17th-century churches, landmark restaurants and pastel rowhouses … the area is and has always been the epicenter of the city’s comings and goings. One of the pleasures of a visit to Charleston is the simple art of strolling, and you won’t find a better spot from which to practice it. Rooms and suites at Charleston Place are spacious and represent an elegant, streamlined take on Southern style: genteel palettes, reproduction period furnishings, softly swagged draperies and marble-clad bathrooms. Armoire-style closets provide plenty of storage; niceties include flexible bedside reading lights and mini refrigerators (ideal to keep milk and snacks chilled for young kids). A limited number of connecting rooms can accommodate families; there are also junior suites and one-bedroom suites that include sofabeds. Cribs are available on request. TIP: Some bathrooms have walk-in showers only — be sure to ask for a tub/shower combination if you’ll need it. We stayed on the private-access Club Level that comprises the top two floors of the hotel, a perk well worth it for families. The elegant Club Lounge serves a complimentary full, hot breakfast each morning, which might include French toast, quiches or a special egg dish. Trays of snacks appear throughout the day to tide over hungry kids, followed by heavy hors d’oeuvres at cocktail hour and platters of sweets as evening falls. The lounge functions almost as an extension of the Club Level rooms — it’s nice to feel as though there’s a retreat where everyone can stretch out a bit and enjoy a change of scenery, not to mention mingle with other families and guests. Although the Club Lounge was our favorite part of our stay at Charleston Place, the saltwater pool ranked a close second. Located just off the spa and fitness area, it’s capped by a retractable roof that opens to let sunshine flood in on pleasant days or closes to keep out rain on not-so-pleasant ones. Nearby, a hot tub surrounded by handpainted murals and porthole-style windows lends the impression of soaking in a private walled garden. While the pool atmosphere is peaceful and you won’t want to let the kids run wild, families will feel welcome and comfortable splashing around. The pool deck segues into an outdoor sunbathing terrace that’s accompanied by a spectacular view over downtown Charleston plus a menu of cocktails and light bites, should you wish to make an afternoon of it. For those who can’t pass up a chance to be pampered, The Spa at Belmond Charleston Place is pure heaven. A vast menu of treatments includes massages, body wraps and scrubs, facials, reflexology and more. Get in the Southern spirit and book a Pampered Peach pedicure, which comes with a signature Pampered Peach Firefly Sweet Tea Vodka Cocktail to sip. Even better, kids 12 and under can choose from their own menu of spa treatments, like a Lollipop Pedicure (complete with sweet treat) or The Cinderella, a 25-minute facial that’s gentle enough for tender skin. Shops line the ground floor of the hotel, with luxury brands such as Gucci, L’Occitane, Kate Spade and St. John well represented. Pink Chicken, a New York-based outfit, offers adorable kids’ clothing. Pick up locally made finds, whether for yourself or for a gift, at the well-curated Belmond Boutique, which also features goods sourced by the hotel’s sister property: the Belmond Venice Simplon-Orient-Express train. Charleston is one of the finest restaurant cities in the U.S., and it would be a shame not to sample some of the renowned venues that blanket this part of town. But you’d be equally remiss not to take advantage of the wonderful dining at Charleston Place. Of the two flagship restaurants within the hotel, the most family-friendly is Palmetto Cafe, a light-filled haven with a pretty alfresco courtyard, and also the lone 4-star lunch-only restaurant in South Carolina. Seafood and Lowcountry fare are the focus, but simpler choices like burgers will appeal to younger guests. Dinner is served at the cozy and clubby Charleston Grill, with a menu that globetrots from Mexico to Manhattan to the Middle East. The highlight is a six-course chef’s tasting menu paired with appropriate wines. Although kids are welcome at Charleston Grill, the vibe is adult-oriented. My suggestion: Have the concierge arrange a babysitter and put a final flourish on your stay with a parents-only night out. Belmond Charleston Place is a quick 20-minute ride from Charleston International Airport. There’s no need to rent a car if you plan to stay in the city proper, but it’s helpful to have one for exploring sights farther afield, such as Patriots Point, Fort Sumter or a plantation home like Middleton Place. For guests who prefer not to drive, the hotel offers taxi service for a fee. 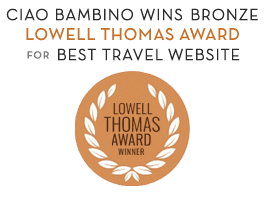 Editor’s Note: Ciao Bambino received a media package in order to review Belmond Charleston Place for families. As always, all opinions are our own. Photos by Lisa Frederick except where noted.